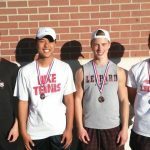 Multiple Teams · Jan 30 Lovejoy High School Varsity Tennis Dominates Lone Star Invitational! 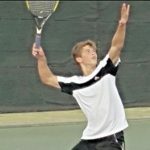 Tuesday, October 20, 2015 12:00 AM Frisco High School AWAY 10 Lovejoy High School HOME 5 Meet Recap The Leopard Varsity Tennis Team fell short in the Area Semifinals 10-5. Tuesday, October 20, 2015 9:00 AM Frisco Independence AWAY 5 Lovejoy High School HOME 10 Meet Recap We won today 10-5 against Frisco Independence. We play again today at 2:00 PM against Frisco High in the area semifinals. Multiple Teams · Oct 15 Lovejoy High School Junior Varsity Tennis beat McKinney High School 19-0 and claim the DISTRICT CHAMPIONSHIP! 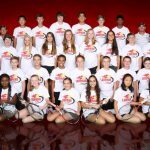 Thursday, October 15, 2015 12:00 AM Mckinney High School AWAY 0 Lovejoy High School HOME 19 Meet Recap The Lovejoy Leopard Junior Varsity Tennis Team finishes their fall season by beating McKinney High school 19-0 claiming the District Championship and remaining undefeated for the season! Multiple Teams · Oct 13 Lovejoy High School Varsity Tennis beat McKinney High School 19-0 and Claim the DISTRICT CHAMPIONSHIP!! Tuesday, October 13, 2015 4:15 PM Lovejoy High School AWAY 19 McKinney High School HOME 0 Meet Recap The Lovejoy Leopard Tennis Team defeats McKinney High 19-0 to finish district play undefeated and claim the DISTRICT CHAMPIONSHIP!!! 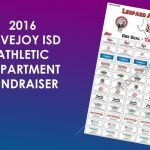 Thursday, October 8, 2015 7:00 PM Lovejoy High School AWAY 19 Wylie High School HOME 0 Meet Recap The Leopard JV Tennis Team continues their undefeated district run by defeating Wylie 19-0! 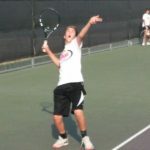 Tuesday, October 6, 2015 4:15 PM Wylie High School AWAY 0 Lovejoy High School HOME 19 Meet Recap The Leopard Tennis Team continued their undefeated district win streak by beating Wylie 19-0! !